Old styles have always reappeared time and again. Today a lot of men prefer the old bearded look over the clean shaved one. And it’s not at all an easy task to maintain the bearded look that we are talking about. The length of the beard and the style that suits one, differ from person to person. An outgrown beard can make one look shabby and is often considered to be a style disaster while a well trimmed one can give you an edge over elegance. This is where the use of the clipper comes in. The clipper not only trims your beard but can be of much use even if you had a short hairdo and want to maintain the look without visiting the salon at regular intervals. You can trim your hair easily all by yourself with a decent clipper and boast of a job well done and also save loads on the salon visits. So if you are planning a beard or already have one or if you want to keep your hair short and do not want to visit the salon to maintain it, Philips Norelco HC7452/41 7100 hair clipper can be a great addition to your grooming kit. 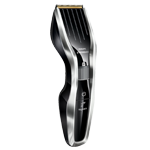 The Philips Norelco HC7452/41 7100 hair clipper is sleek, lean and graceful. The black and silver glossy plastic body has a unique curve at the middle which makes the clipper head lean a little backwards. The clipper handle tapers at the curvature, so that it can comfortably fit into your hands and you can have an easy grip while making your way through your beard or hair or your sideburns. The clipper handle bears a power button, a turbo boost and a length setting adjustment roller. This minimalistic approach to ‘controls’ gives it the extra gripping space and adds subtlety to the design. The cutting element of the Philips Norelco HC7452/41 7100 hair clipper consists of an advanced titanium blade and a robust stainless steel guard. 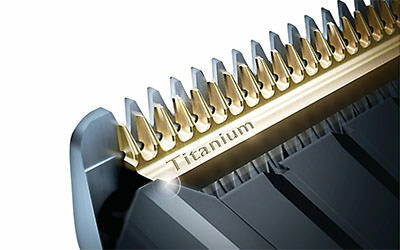 The titanium blade is better than steel in terms of strength and durability. These blades are self-sharpening and are equipped with Dual Cut Technology which minimizes the friction between the doubly sharpened blades and enables faster trimming. 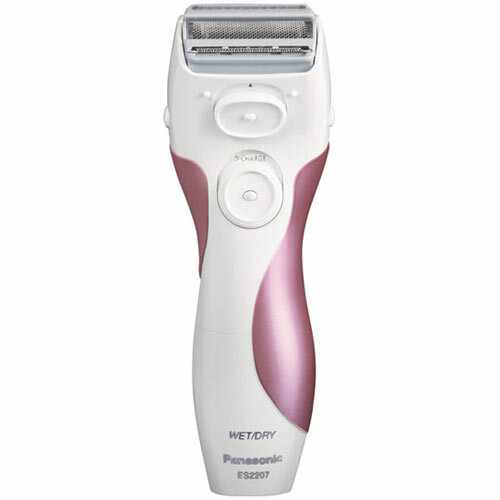 Philips Norelco claims that with this technology the clipper is twice as fast as its older counterparts. The clipper comes with an additional trimmer comb that can be fitted to the clipper head and with the length setting roller you can adjust it to the desired length. The roller has 23 adjusting lengths ranging from 1mm to 23mm with a setting lock after each mm from left to right. So you can just rotate the roller to the required length and lock it to achieve the desired trim. You can also remove the trimmer comb and get closer to about 0.5mm. With 24 length settings at your disposal you can create your own style in the blink of an eye. 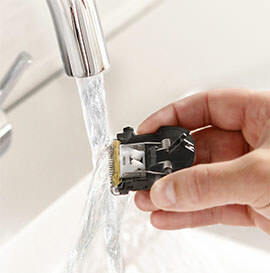 There is a turbo boost option below the power button that adds to the efficiency of the clipper. 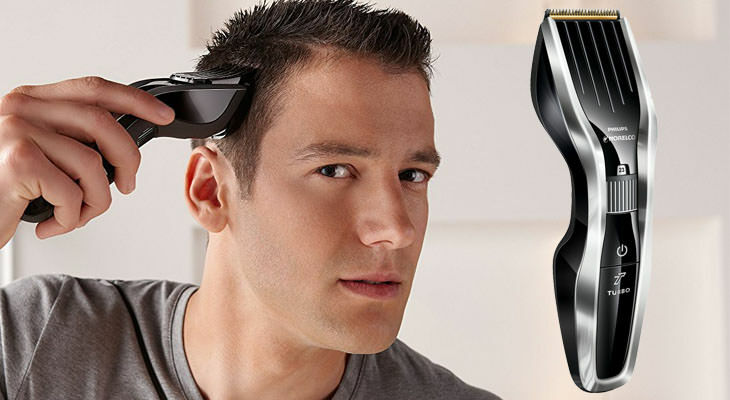 It enhances the speed of the clipper-blades and gives you a faster trim. The turbo boost is also of great use for those with thicker hair wherein it increases the effectiveness of the trim. The Philips Norelco HC7452/41 7100 hair clipper can be used dry only. It is not suitable for a wet trim and is not advisable for those who prefer to trim under the shower. The Philips Norelco HC7452/41 7100 hair clipper is rechargeable. It is powered by a Lithium-ion battery. This takes an hour to charge fully and will give you a cordless usage or trimming time of 120 minutes. There is almost no loss of charge on storage. This is huge compared to the 45minutes to 1 hour of usage time of most clippers. So this clipper can go on for months before you have to recharge it and it is an ideal travel companion. The charging cable and adaptor has worldwide voltage compatibility (100V-240V) and can be used hassle-free all over the world wherever you go. It’s important to clean the clipper head after every use. This is to maintain the hygiene as well as increases the durability and prevents the blades from clogging. Cleaning the Philips Norelco HC7452/41 7100 hair clipper is easy. There is a quick release button at the rear of the clipper head. On pressing this button the clipper head comes off and it can then be held under running water to free it from all residual hair strands. A cleaning brush that comes along with the kit can also be of much use. The Philips Norelco HC7452/41 7100 hair clipper is almost maintenance free. It only needs to be cleaned every-time after use. There is no need of oil to maintain a low friction blade movement. The Philips Norelco HC7452/41 7100 hair clipper comes in a hard reliable case. It can be easily stored in this case for maximum durability. 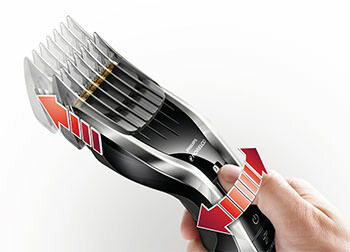 The presence of a single trimmer comb also reduces the chance of losing an attachment. Philips Norelco provides a two year worldwide warranty on this product on purchase. If you register the product online after purchasing it, then an additional 3years warranty is given. Thus you will actually receive a 5 year worldwide warranty on this product and given the reputation of Philips you can completely rely on their support. Though there are a few obstacles in the use of this clipper but they can be dealt with easily considering the fact that this clipper is one of the most acclaimed of those in the business. Owing to the ease with which one can use this device, it’s ideal even for first timers and a nice and handy companion to complement your grooming set. Hair strands stick to the long trimmer comb and has to be often washed to avoid clogging.